Is there anyway to create a pattern with a connected midi controller or is mouse-clicking the matrix the only way to do this? 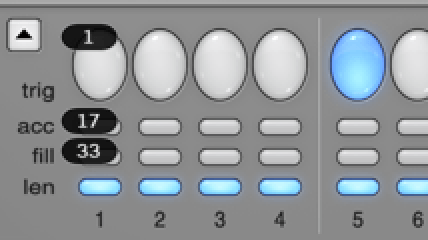 I've been able to map and play presets with the midi controller and I can't track in the DAW, but I'd like to be able to create patterns from the controller rather than by single mouse clicks. In this example, trigs would be CC 1->16, accents 17->32 and fills 33->48. Microtonic can also send CC (check "MIDI Config") so if your controller has LEDs you might be able to light up enabled steps properly too.